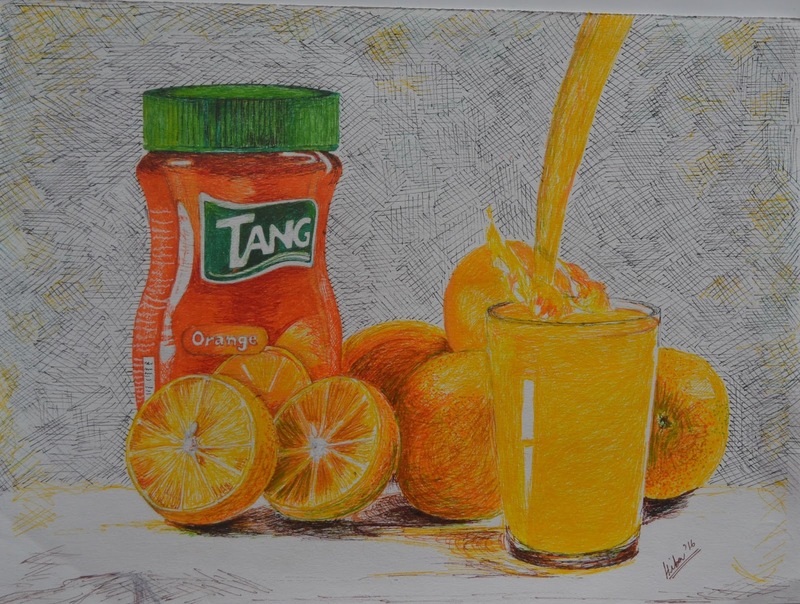 A few days ago I made a pen drawing of Tang using a combination of coloured pens which included brands like Staedtler (0.3 mm coloured fine liners), Dollar and Signature pointers, and Sakura Gelly Roll for the white colour. Artists would agree that the most challenging part or difficult at times perhaps is the drawing stage where you have to ensure that your drawing is perfect, the rest is as easy as a pie! This is where I taped my sheet to the board and made my drawing based on the reference I had downloaded off the internet. Keeping the typography intact and proportionate was one of the most important aspects of this drawing. So this is where I started off with the pen work, making use of all the wonderful brands I mentioned at the beginning of this post. I started with the cap, moving all the way down with orange. Staedtler's variety of yellow and orange shades were great for getting the true colours of Tang's packaging and that of the beverage itself, pouring down, in the glass. I try not to waste paper for printing the reference, therefore, I often use my mobile phone for the soft copy. 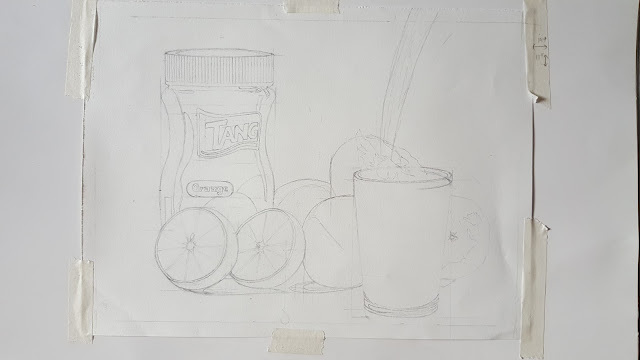 So this is where I got done with the jar itself and moved to the oranges, leaving white spaces for the seeds and the fine lines in between. So the entire subject was complete with white spaces depicting reflection and highlights (in the jar, oranges and the glass). It was now time to fill up the background to uplift the foreground and highlight a three dimensional effect. Tadaa! Here's the final drawing. I used cross hatching to fill up the background and used warm colours for parts where shadows were to be cast. Hi, thank you for sharing such brilliant pieces of art. I am an art student at kgs and was wondering if there was an email address i could contact you on to ask you a little about one of the pieces in this blog. Thank you!